View our inclusive African hunting packages and book now. $12 000 - 7 Night Deluxe Big Game Hunting Package. This is Arc Safaris flagship hunting safari package. Experience raw Africa with a highly respected and experienced team. Enquire Online Now and I will personally get back to you. Our inclusive African hunting packages are a unique blend of opportunities for you to hunt on the vast African plains. From tackling the toughest animals such as the buffalo to tracking and hunting plains game such as the various antelope, our hunting packages are ideal for the amateur as well as the seasoned hunter looking for a new challenge. Your hunting experience is as much about the trophy as it is also about spending time out in the quiet of Africa. To make the experience as unique and enjoyable as possible, we will arrange for your transport as well as your accommodation and your general schedule. When you are booking a full hunting package, saving money is usually the first, and the greatest advantage, you have. The second advantage is that we try to make sure that no two hunting experiences are exactly the same. We have designed custom hunting packages, each one unique so that you get the hunting experience that you are looking for. Hunting on the great African plains is something that you might only experience once in a lifetime; this is part of what makes a unique hunting package the best option for you. We have created this hunting package to give you the ideal amount of time to hunt your trophy of choice. On the first day of your hunting safari you will be collected from the airport, or if you are already in the area, we will collect you from your accommodation. After we have you comfortable in the vehicle, we will drive you to the game park where the hunt is going to take place. 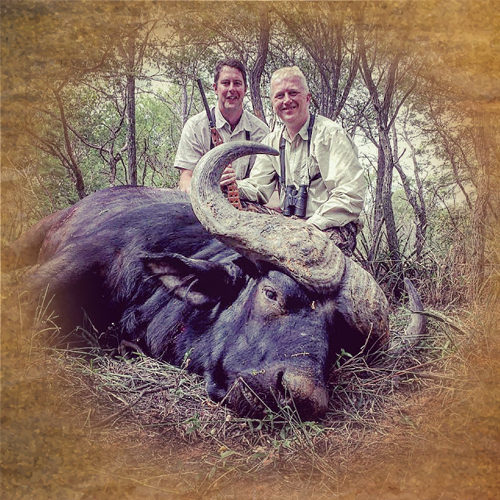 You will be in the company of the professional hunters with whom you will be spending your hunting safari. The day begins with a Light breakfast, to get your strength up for the day ahead, and a chat about the coming hunt. After we have enjoyed a meal, the rifles will be checked to make sure that they are in perfect condition for a safe hunt. The vehicles are then packed and we head out into the field to track down the trophy that you are after. After a morning spent hunting, we return for brunch or we take a packed lunch out into the field to recuperate after the morning’s activities, relaxing for a while before resuming the hunt in the afternoon. Once the sun begins to set, we will return for drinks and a delicious dinner, discussing the day’s events and sharing stories before retiring for the night. Again we begin the day with a Light breakfast before we check our rifles and hunting equipment and then we head out for another day in the African bush. After an energetic morning spent tracking and hunting, we stop for a quick lunch or we head back to eat a meal. This short break is then followed by another afternoon spent hunting. In the evening we settle down for a relaxing dinner and a few drinks celebrating the end of a successful hunting trip. On the final day that you are with us, we will take care of any outstanding fees and the associated admin before we drive you back to the airport or drop you off at your next destination.